When I first stepped inside the neonatal intensive care unit to see my preemie twin boys, I was the epitome of a new mom. I was terrified at the thought of holding my tiny babies, shell shocked at what my babies and I had been through over the previous three days in the hospital (*I delivered Noah and Nikoh at 29 weeks, via emergency C-section), consumed with heartache and physical pain and overwhelmed at the thought of instant, premature twin motherhood. I didn’t think I was strong enough to be a NICU mom. Hell, I didn’t even really understand the importance of what the letters N-I-C-U actually meant. I did, however, learn — very fast– how critical the NICU was to my babies’ development and survival and how my plan for motherhood would never be what I expected. But when I walked out of the NICU for the last time, about 1 month after my twins were born, I emerged a motherhood ‘warrior’ of sorts…complete with emotional battle wounds and physical scars that will last a lifetime and serve as reminders about how the NICU changed me for the better. Whenever I stop and think about our NICU experience, I often remember some of the things I learned, but have forgotten over the course of the last two years. (*As a new mom to twins my memory has suffered because my brain is often on overload!) The biggest lesson was most definitely being at peace with being able to “mother” my preemies despite and through all of the NICU limitations. So in celebration of Mother’s Day 2016, I wanted to share just a handful of my NICU memories to potentially give a little bit of hope, and maybe even some strength, to other moms, dads and families who may be blessed with a premature baby/ies as we were on March 26, 2014. Needless to say, these little things made all the difference to me and my spirit. The Power of a Firm Touch: I remember one of the first times I was able to caress my tiny babies, one of the NICU nurses told me I was doing it all wrong. Initially her saying to me, “Don’t rub him so softly, you’re agitating him. Place your hand on him firmly,” really bugged me. More than likely it was because I was hypersensitive in that moment, and I felt like saying to her,”Look lady, I’m his mom! I will touch him how I want.” But once I realized my job as mommy was to make my babies feel as comforted as possible, I appreciated the advice and grew to love those firm touches. And in the moments were Noah and Nikoh would cry and whimper out of discomfort from the endotracheal tube, C-PAP machine, jaundice sunglasses, Picc lines and feeding tubes, the warmth and feeling of the firm placement of my hands and those of my husband often seemed to calm them down and give them peace and comfort. We have continued to practice the power of the firm touch over the past 2 years, most recently when our son Nikoh had surgery for an inguinal hernia repair. When he was in recovery, he was crying unconsoleably as the anesthesia was trying to make its way out of his little body, and when the nurse handed him over to me I grabbed him and placed my hand firmly over his neck and back, and held him tight right against my chest. “Great job mommy, you’re a pro,” the nurse said to me. It felt SO good, in that overwhelming moment, to know my time in the NICU prepared me for that instance when Nikoh needed me to be strong and know exactly what he needed to feel a little bit of comfort. Your Heart Will Survive: I was discharged to go home 6 days after Noah and Nikoh were born. Although they were in the NICU, I was accustomed to being able to walk down the hall and visit them multiple times a day and night. But when I was released from the hospital, my heart felt like it was being ripped out of my chest when I had to leave them behind. The majority of moms and dads get to take their newborns home when they are discharged, not the case for the parents of premature/NICU babies. It’s heart-wrenching, and although as a parent you understand the NICU is where your preemie needs to stay to continue to develop and get strong, all you want to do is sit by their incubators around the clock until it’s time for them to be discharged too. I remember the exact second when I walked out of the hospital, empty handed without my twin boys. It was a Sunday evening, and my husband and I had spent the whole day in the NICU. My mom and sister arrived at the hospital that night as it was time for us to leave. My husband was going home so he could get ready for work the next day, and I was going to spend the night at my sister’s house since she lived much closer to the hospital. I remember crying so hard I could barely breathe, and my family just tried to console me and explain to me that I’d be back at the NICU in a few hours. I could feel my body giving out in a way, my legs felt weak like I was just going to slump down to the floor of the hallway and just curl up in a ball. I remember my mom and sister hugged me tight, and in that moment they physically helped me keep it together. Somehow I managed to get into the car, and I cried all the way to my sister’s house. And when I woke up every two hours to pump my breast milk for my babies, I cried and cried until I fell asleep. That was my routine for the better part of one month. Your heart can and will survive the NICU, but often during your journey, you most definitely will need to depend on your family to give you the strength that you likely will not have. Don’t Be Afraid to Call: When my boys were in the NICU, every nurse new both my name and my face. I was there from early in the morning, until late into the evening, at my babies’ bedsides. And when they finally forced me to go home at the end of the day, you better believe I was calling the 24 hour NICU parent line multiple times a night. At first I was a little hesitant, and I didn’t want to call too much and “bug” the nurses who I know have life and death jobs to do. But at the same time, my two babies were there in the NICU all alone, and it was my job to make sure they were comfortable and still thriving while my husband and I were gone overnight. The great thing about the NICU parent line is that I was able to get updates on absolutely everything that had to do with my babies. Feedings, bath schedules, updates on their conditions, plans for the following day, I was up to date and I knew it all. It meant the world to me being able to pick up the phone and get the reassurance I needed at any given moment. Are You ‘Sure’ it’s Time to Go Home: When you are a NICU parent, everyday you’ll ask your doctors, “When can my baby come home?” We asked this question everyday, twice a day, once for each of our twin boys. Don’t expect to ever get a straight answer. You’ll never get a set date, at best you’ll get a general idea of when you might expect to take your baby home. And for us, we knew we’d almost certainly take our babies home on two different days. And indeed, we did. Noah came home first, and Nikoh followed 10 days later. The ironic part of your baby FINALLY being released from the NICU, is when it’s finally time..you’ll likely want them to stay longer. I spent more than one month counting down the days until my babies came home, and everyday I asked, and asked and asked, “When can they come home?” Then one morning I was on my way to the NICU and my phone rang and I recognized the NICU phone number. “Hi mom,” the nurse said. “Noah is ready to come home. How soon can you pick him up?” Just like that. My heart literally skipped a beat, tears streamed down my face and I felt like running into the NICU to grab him and take him home. But then fear began to consume my body, and I began to second guess, “Is he ready? Am I ready for him to come?” The short is answer is yes! Noah was ready!! But his mama was not. Emotionally I was NOT ready to bring him home. Mostly because I was so afraid to be a new mom after all he’d been through, and secondly because I was not ready to leave Nikoh behind. Noah being wheeled out of the NICU and on his way home! I knew once I took Noah home, I would have to focus on him at home and I wouldn’t be able to spend much time with Nikoh in the NICU. It was hard. So very hard, and so sad to take one baby home while the other one had to stay by himself. Those 10 days were very hard. A big part of me felt like a bad mom because I felt like I had abandoned Nikoh. I prayed that he would understand and continue to progress without my constant love, touch, and kisses. And wouldn’t you know, he did. He did amazing on his own. He did so much better than his emotionally-wrecked mama! And Noah thrived at home too. He spent his first days at home enjoying being an only child for those 10 days. He got all of my love and attention, while Nikoh enjoyed his daddy’s company every night after work. But when Nikoh came home the twin reality of constantly having to share their mom and toys and everything else set in quickly. And it likely will be that way for a long time. But we wouldn’t have it any other way! Their twin bond is a force to be reckoned with! Noah (left) and Nikoh (right) together during their first week at home in April 2015. 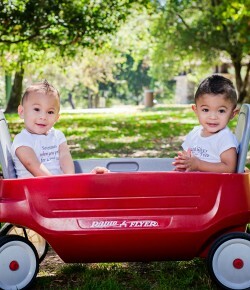 As of today it’s been just a little over two years since my twins left the NICU. That part of our journey is somewhat of a distant memory now, yet I am still unable to fully comprehend how we made it through the hardest time of our lives. It took a lot of faith, a lot of prayers and a lot of support from our closest family members and friends. Somehow I was strong enough to survive the most miraculous, and heartbreaking, time of my life. Everyday I feel a huge sense of relief knowing we survived. And if you ever find yourself in the midst of the NICU roller coaster, please know you’ll survive too. It’ll be an emotional battle, but NICU parents are built to be survivors and I promise you’ll make it through.